Following the obligatory coffee at the Fudu, a slow and aimless meander down 80th Street, the few people collected along the roadside somewhat confused as to what this tall foreigner would be doing on this ancient bicycle, randomly taking photos of apparently entirely irrelevant subject matter. 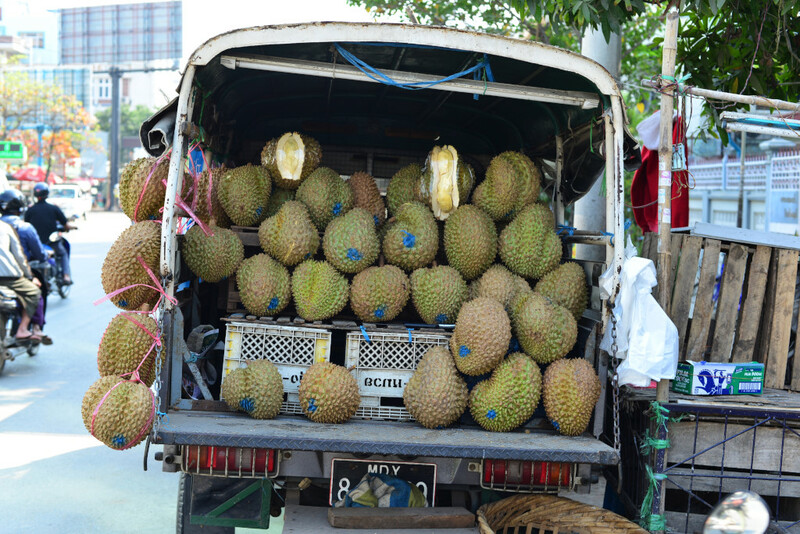 The fruit stalls on the street corners are complimented by a series of trucks parked along the street, luridly displaying the heavy durian stacked in the back, the evil waft of the fruit strengthening as the vehicles come into view. Two slightly frightened young women are seated next to a wall of motorcycle helmets and other paraphernalia catering to the constant stream of riders passing by. The young man servicing the telephone kiosk who can’t emerge from his stupor is an easy target, although considering the ridiculous hours people are expected to work here, his weariness should hardly be a source of easy laughs. 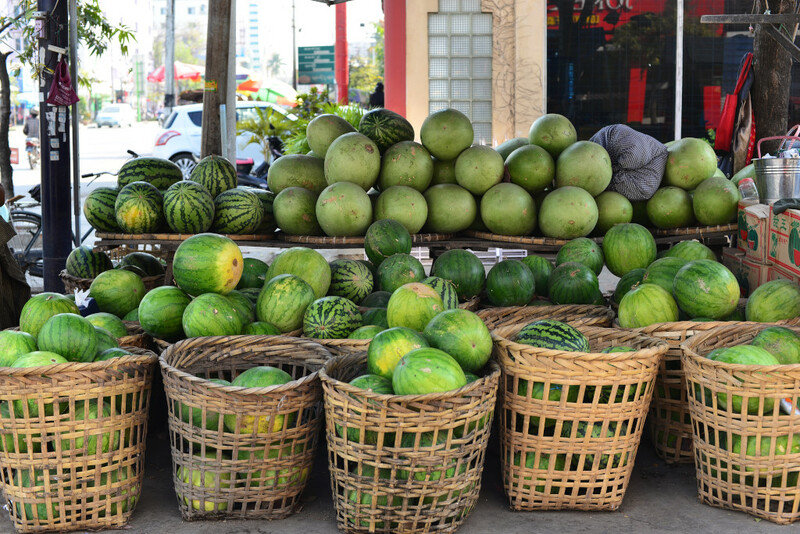 The adjacent watermelon stand is a regular destination during my stay in Mandalay, although it is also not clear to me how they can expect to sell that much fruit every day, based on the overflowing baskets, the pre-cut fruit going bad by the late afternoons. 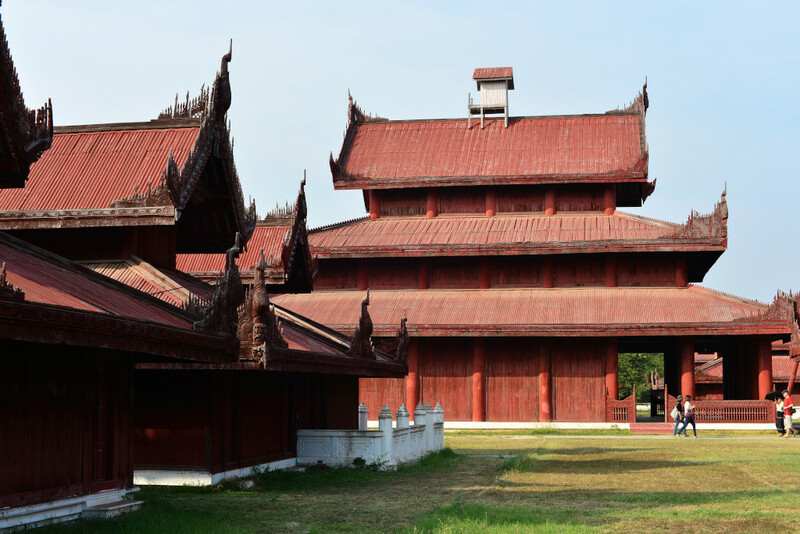 As characterless as Mandalay may appear on the surface, it really has much more to offer than initially meets the eye. 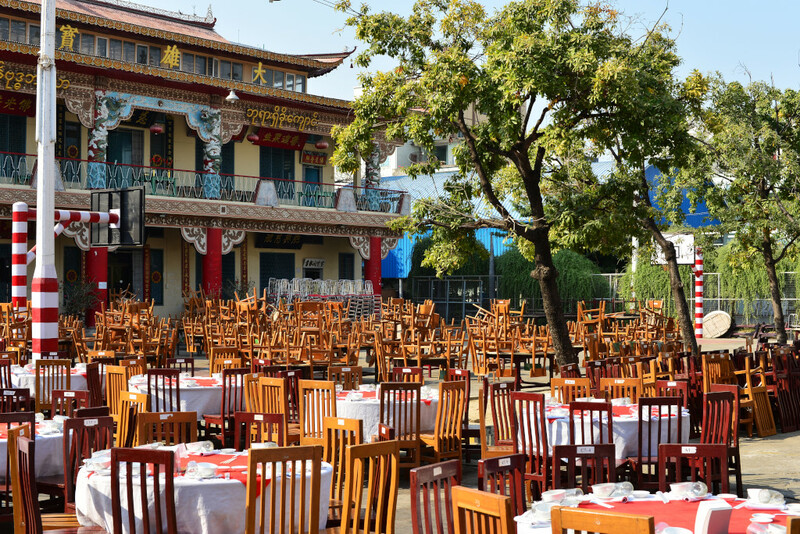 It features many religious structures, prominent on 80th street near the train station the Yunan Taoist temple with its assembly hall and large kitchen, the spread of tables and chairs in front of the canopied podium and stacks of plates along the countertops indicative of some larger function about to take place. 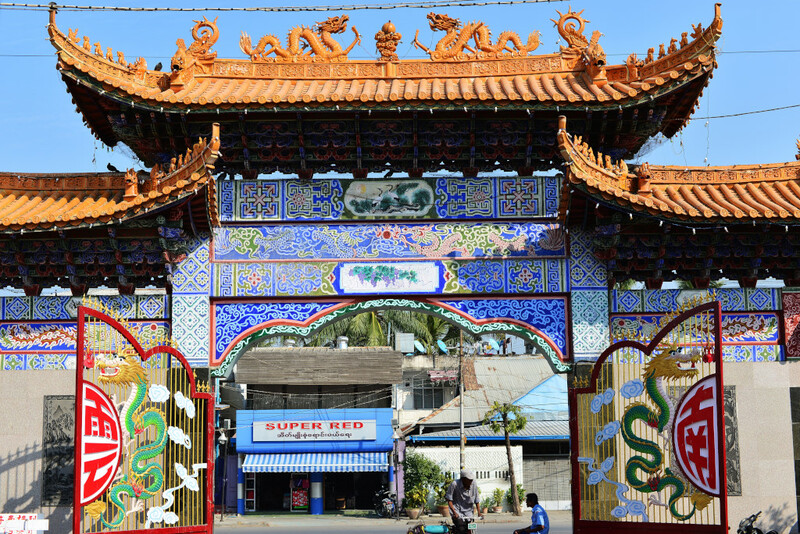 Elaborate symmetrical blue patterns adorn the lintels underneath the terracotta canopy of the entry portal to the temple crested by rearing dragons, more of their ilk emblazoned across the open gates. 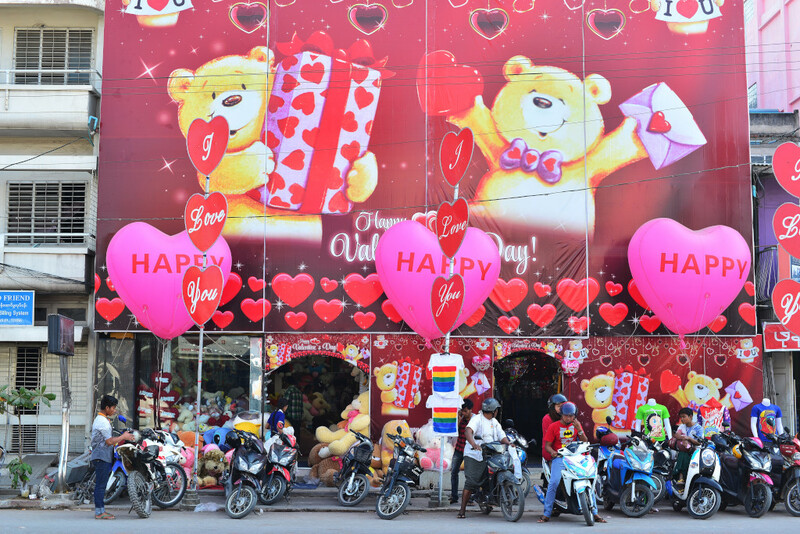 The approach of Valentine’s Day offers a retailing extravaganza of pink hearts, boxes of chocolates, and cute teddy bears at roadside stands, accompanied by deafening pop music bound to attract the starry-eyed teens racing by on the their motorbikes. Over the bridge and into another world, of serious shopping, larger markets, and much more money, the roadside vendors selling their limited wares from their rudimentary roadside shops, and food stands standing in stark contrast to the overgrown formulaic Chinese luxury-style villas and pricey hotels catering to tour groups and wealthier locals oblivious the conditions around them. 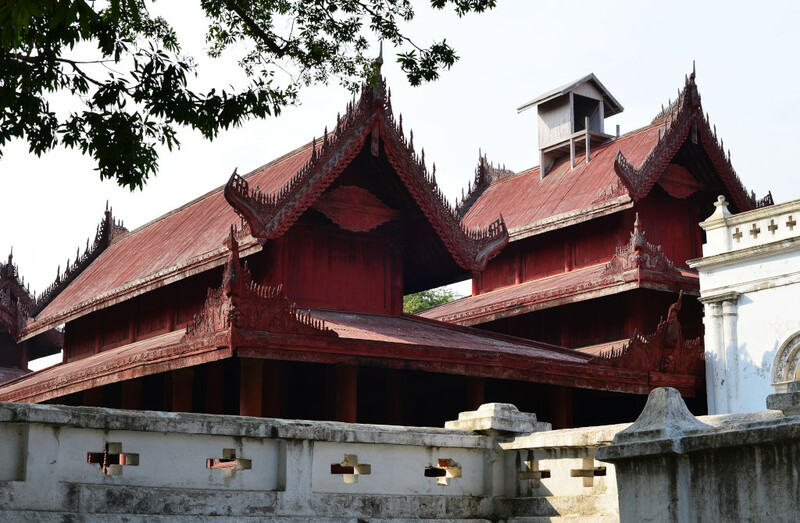 The Shwe Nan Daw Kyaung or Golden Palace monastery was originally part of the Amarapura palace complex, but was shifted to Mandalay to become King Mindon’s royal apartment. 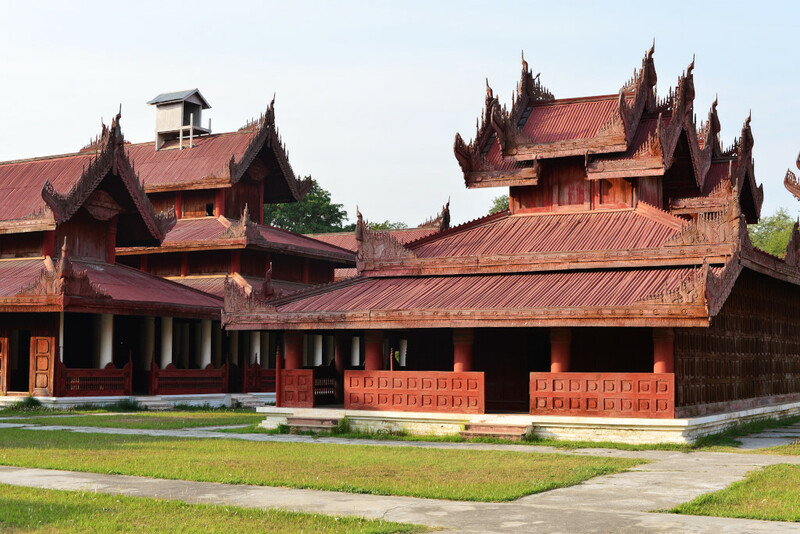 After he died, Mindon was succeeded by King Thibaw, who had the palace dismantled and rebuilt as a monastery northeast of the fort. 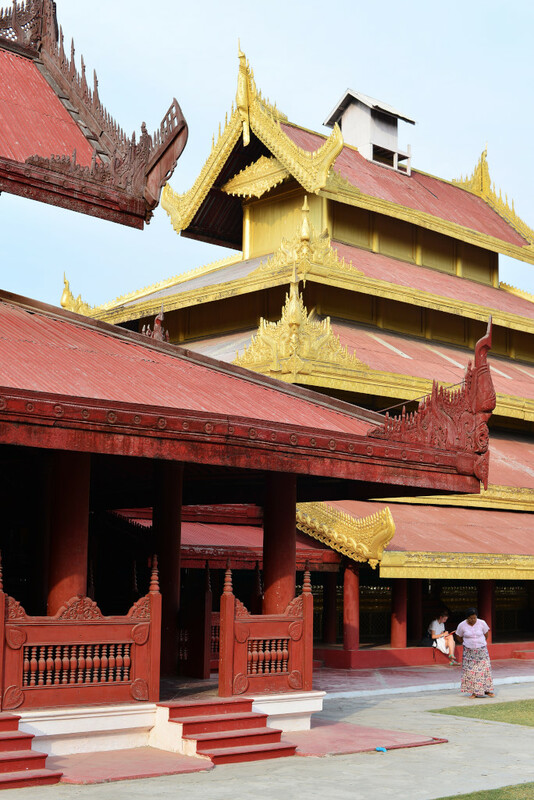 The Golden Palace is one of the main attractions of the Mandalay area, and rightfully so. The interior is not as spectacular as the exterior, but the detail and architectural precision and symmetry is breathtaking. 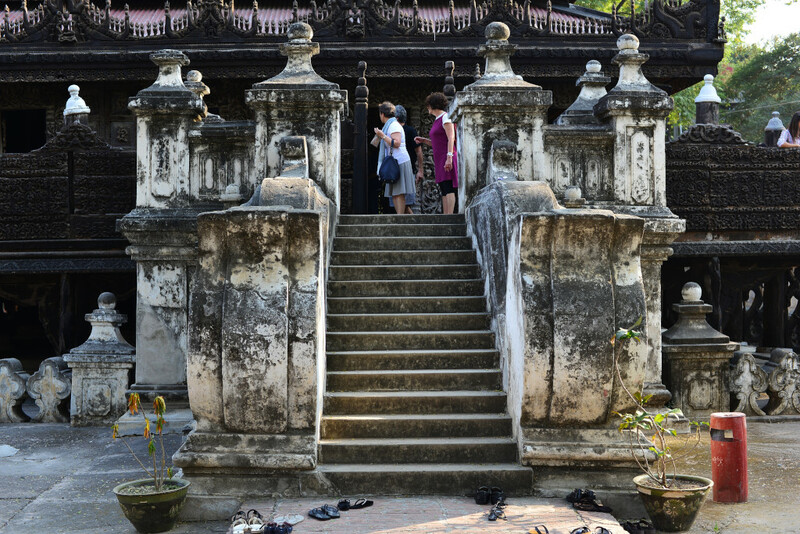 Heavy stone railings flank staircases leading to the first floor, a dense symmetrical floral tapestry hewn from the outer verandah’s teak cladding, and in amplified form encircling the evenly-spaced doors offering entry to the palace interior. 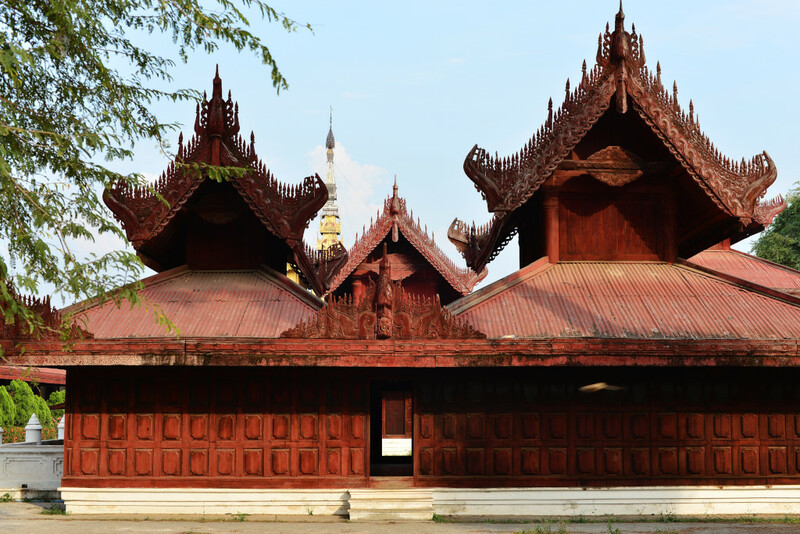 The tiered roof terminates in wave-patterned bargeboards crowned in a succession of bristling finials, and the elaborate depictions of bodhisattvas dancing across the hypnotic and intricate imagery hewn from rich teak knows no equal. Sinuous coils threatening to engulf the nested rosettes and solemn religious sentinels rise over preening crested birds, mythical creatures rearing amidst what look like erect prows. 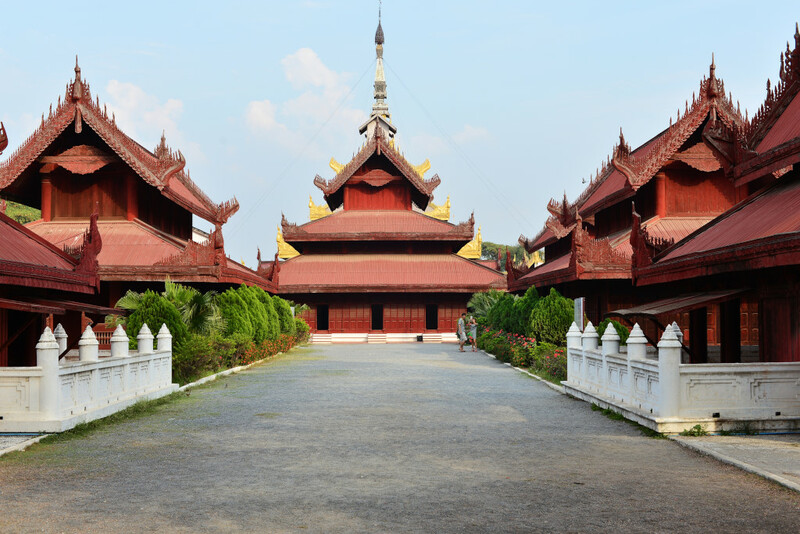 The interior is divided into two separate spaces, and far simpler than the elaborately sculpted exterior. 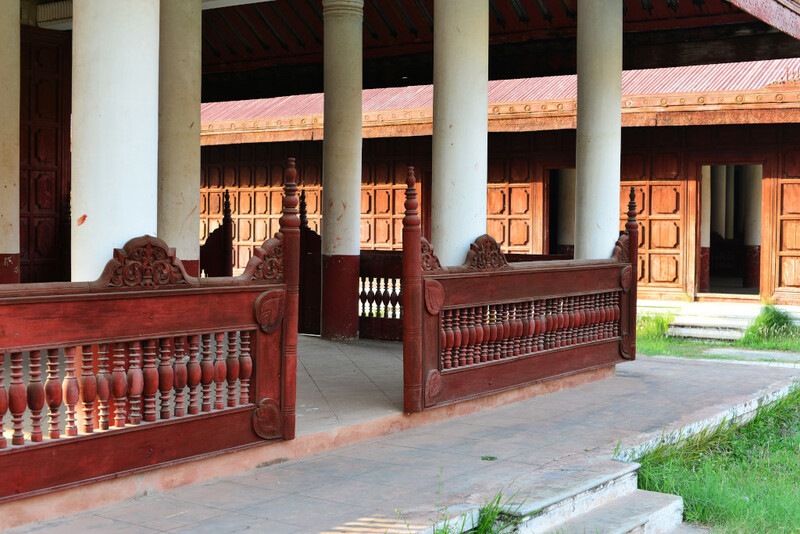 Elaborate designs on the wooden slats running along the ceiling are less contoured than found in the exterior work, although the fact that the interior is unlit doesn’t help. 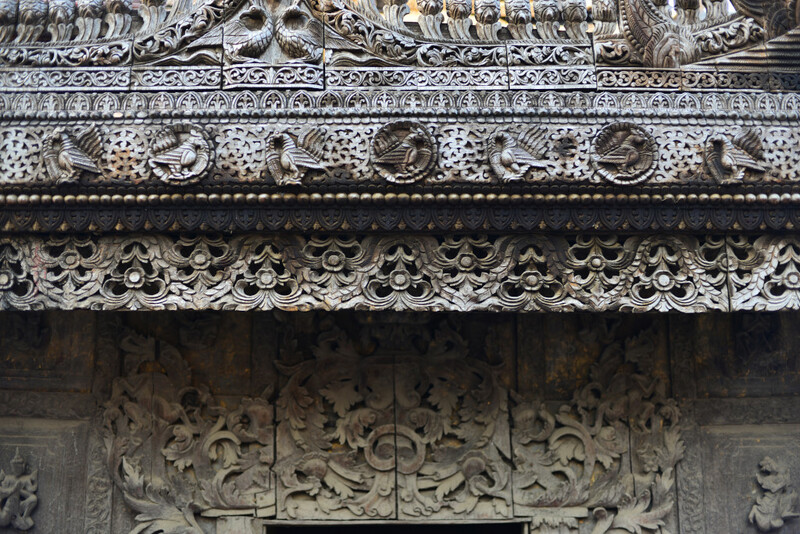 Intricately sculpted spandrels join the columns regularly spaced through the interior of the palace. 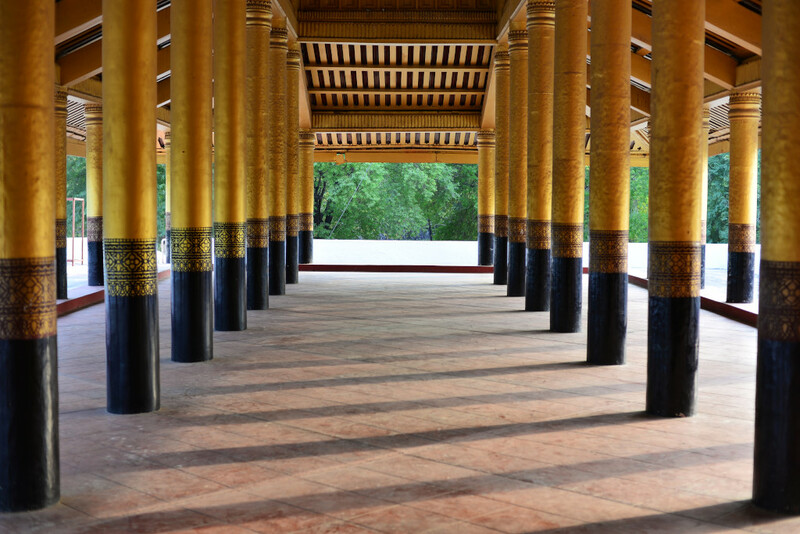 A small Buddha is seated in front of a mirrored rear wall segment, flanked by raised columns with more intricate carving, the coffered walls surrounding the altar space featuring small, evenly-spaced figurines. 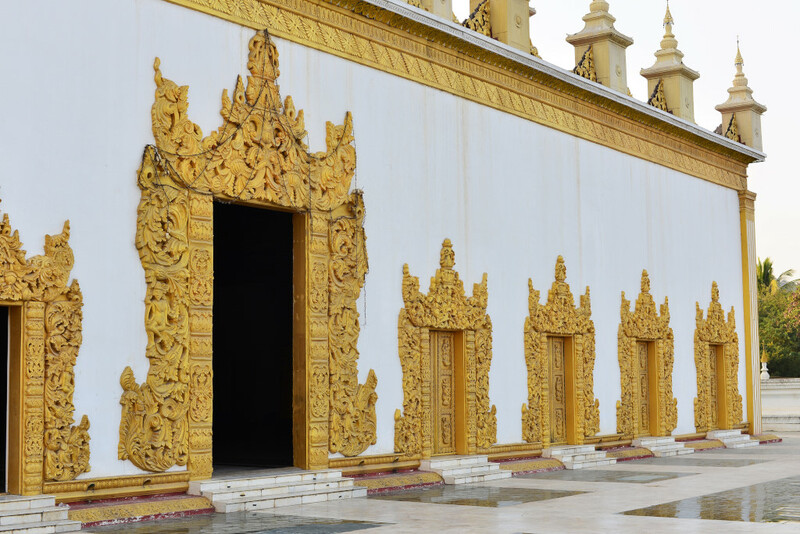 Doorways connecting the two interior spaces are excuses for more wildly imaginative floral carvings occupying the mock frame, the doors themselves covered with a set of bodhisattvas in differing positions. At the stellar hotel breakfast, a young German couple are eager to hear my recommendations for traveling in Southeast Asia, particularly for the countries they have not yet visited on their one-year trip. It’s as much coherence as I can muster at this point, considering that I have been up awake from early on today, the squealing door next to my room opening and closing from the earliest hours of the morning, and then someone loudly clearing his throat if not altogether vomiting. No reading of the New Light of Myanmar for me today. Several more hours of writing, then downstairs, the young woman informs me that a foot bridge on 31st Street in fact leads over the train tracks, which means I can walk to the train station when I leave. Slow as the internet may be, I troll Tripadvisor for recommended restaurants just to see what I can come up with in the vicinity of my hotel. I find Aye Myint Tar, on 81st Street between 36th and 37th Streets. The short bike ride there is uneventful except for a man methodically gluing an image of Aung San onto the roof of his tuktuk. The idea had been to simply top up the marginal breakfast at the hotel, but the gargantuan spread you are automatically given in Burmese restaurants is overwhelming at the very least. A set of side dishes is served in plenitude, irrespective of whether one or a table full of guests appears. 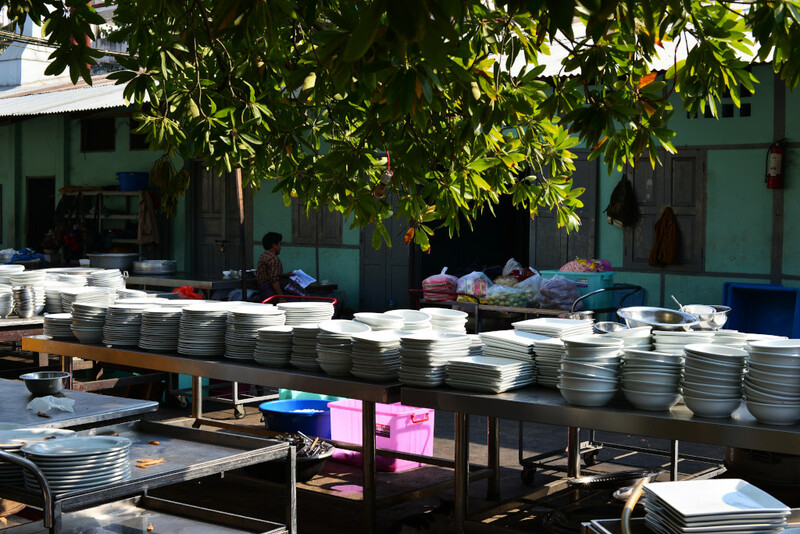 The troop of white-shirted, longyi-wrapped waiters watches the tables like hawks, not letting the potential emptiness of any dishes elude them, refills presented to the client automatically. The 3,000 kyat for a basic curry would be reasonable under normal circumstances, but seems ridiculously low for the avalanche of food provided. 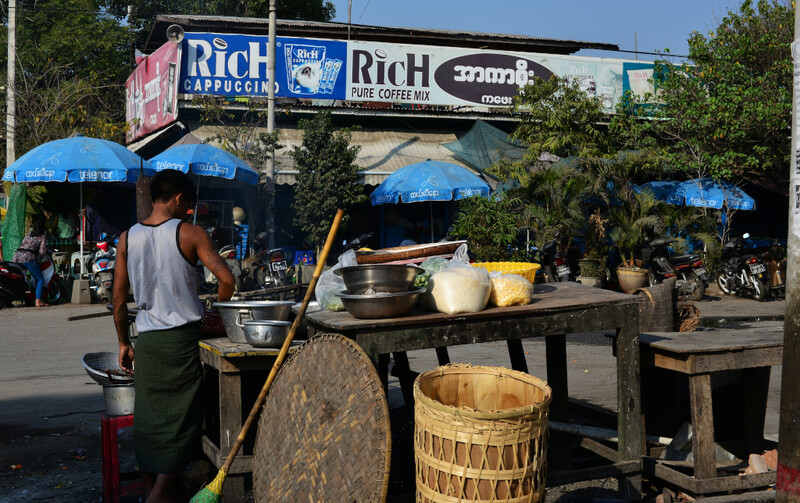 What I find strange is that Burmese are not fat: sure, most cannot afford fine dining, but the roadside eateries presenting food to the masses serve almost as generously as here. One of the waiters politely enumerates the side dishes for me: bee hing, the slightly sour, lentil-based dhal, aloo, mildly curried large potato chunks that takes its name from Hindi, magyig myichin, a somewhat rank and very spicy combination of steamed bamboo with fish paste, tamarind and chili, khai, green tomatoes braised with traces of shredded white cabbage and peanut, labie, a mix of mashed fish, shrimp paste and chili, gabiye, a sauce made from fish past, emjaye, chili flakes, ato amogo, the Burmese salad intended to be dipped into the child and fish paste sauces, consisting of carrot sticks, lettuce leaves, cold steamed baby aubergines, and finally, a dish with some cold sour leaves that is allegedly tea as well as a mix of roasted soy, peanuts and sesame. 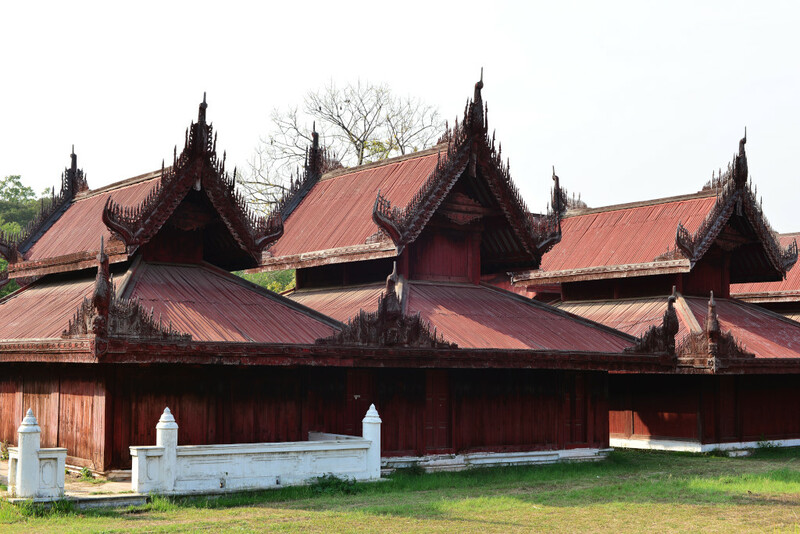 There are common elements with other Southeast Asia foods, but Burmese food is quite unique in terms of the use of fresh vegetable salads, the heavy use of fish paste, the plethora of small dishes, very mild curries, excessive use of oil, and above all the use of sour foods. Where most Asian cultures are quite parsimonious in their provision of rice in restaurants, the Burmese really heave it onto your plate. The monks in dark robes seated at the next table watch me, aloof, some of their secular compatriots less so, but the curiosity I arouse dissipates once a European tour group arrives at the next table. 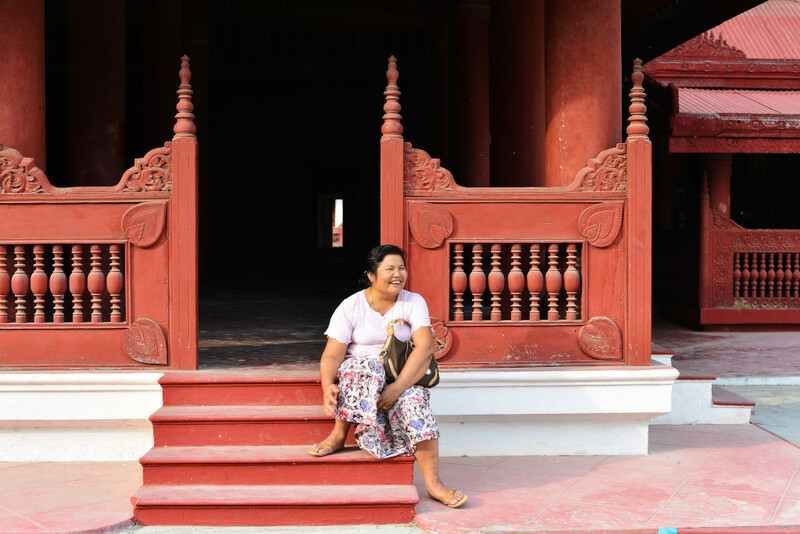 Next to me sit a young French couple, the woman of Cambodian origin, far more comfortable with the fish and shrimp paste than he is. Strangely enough, I feel somewhat motivated (at least at the very moment) to indulge in a food I had heretofore hated with a passion, and yet I actually have been exposed to it for so long, at least in trace amounts, that it may have a far less shocking impact than I would care to admit. The effort of buying a train ticket could not have gone more easily. Crossing the bridge on 35th Street and then riding up Mandalay’s most ostentatious shopping street, I pull into the train station parking lot, heaving my rickety undersized bicycle amidst the long row of motorcycles. 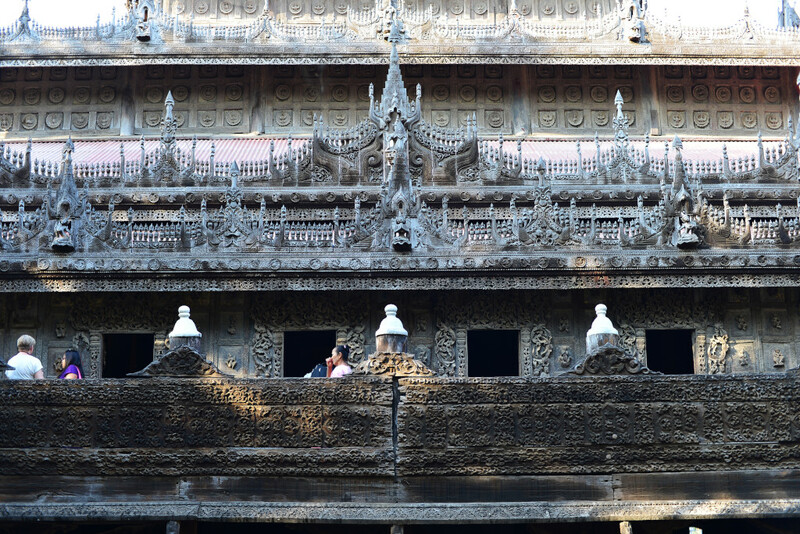 The imperious woman in the MTT office hasn’t much of use to tell me, other than that she does not believe that there are boats heading south on the Irrawaddy from Myitkyina towards Mandalay. There are four trains a day, but probably not boats, most likely just as of Bhamo. If there are, I will take boats back, and if not, then the train will have to do. 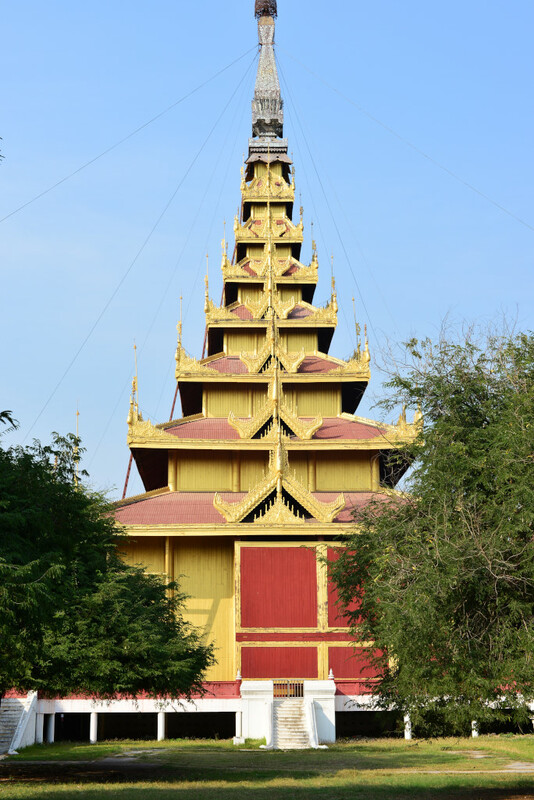 And I can in fact go to Sittwe, but will have to take an express bus from Mandalay, which means returning back to the city, which I had not initially planned. She can’t advise me as to how I can descend the coast of Rakhine state – I will have to see for myself. 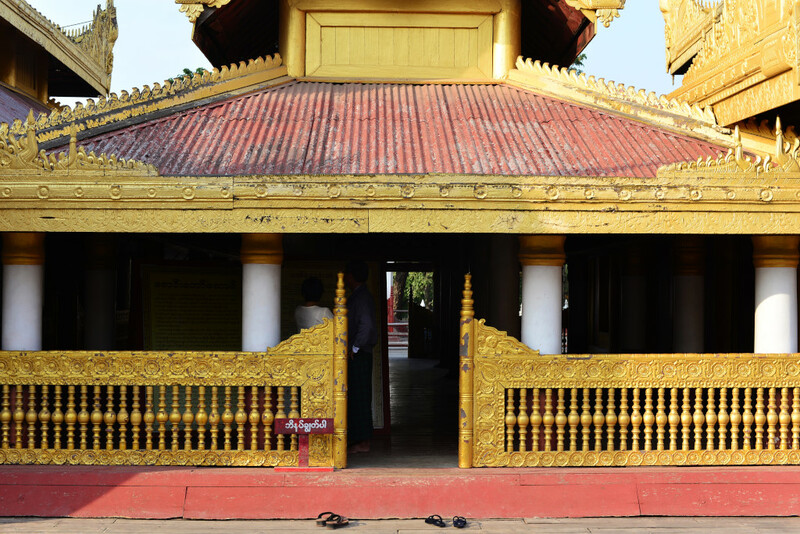 It is not possible to visit the villages north of Mrauk U in Chin state – and yet as recently as six months ago an official publication included a detailed article written by a backpacker penetrating into the state on her own, specifically without permits. Ambling along the roads running east of the train station, I reach the Koffee Korner near the Sedona hotel, far too dark inside. Outside, an older Mexican-American erupts into a virulent tirade of insults when I probe as to where he may be from. Rabble like him would be better staying at home, wherever in the U.S. that may be. The receptionist at the very posh Sedona hotel assures me that there is no way I could use the fitness centre at the hotel without being a guest, and it takes a number of further phone calls to establish that a public fitness centre may be a few blocks away. I am skeptical, at least inasmuch as the cafe she recommends further east on 26th Street is nowhere to be found. 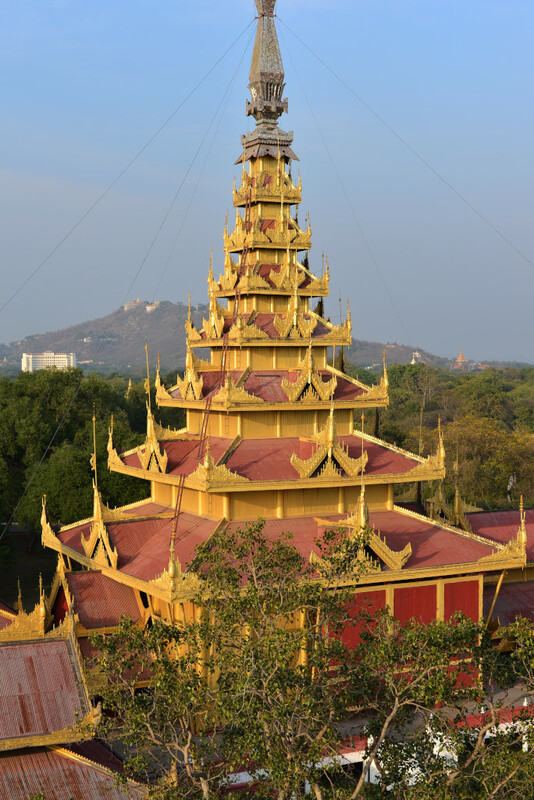 The only attraction of any interest in the relaxed and more affluent part of the city would be the Skinny Buddha, whose aesthetics represent a shrill and garish departure from the usual sense of harmony and serenity found at temples in the country. 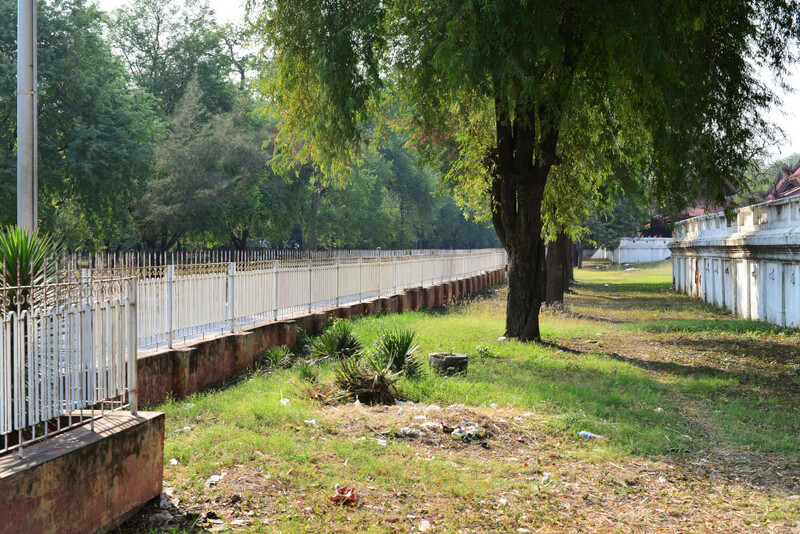 The motorcycle taxi drivers call to me as I glide by on my bicycle across the moat towards the entrance to the fort, which brings me to the pompous soldiers who demand cyclists and motorcyclists dismount while passing through the gate. This seems a bit ludicrous, but who am I to argue with them. 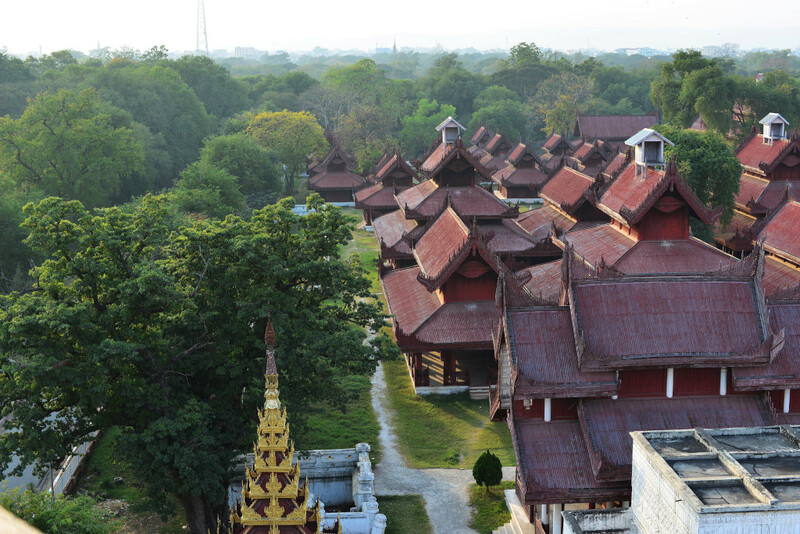 The palace is located at the end of a long lane, offering views into what presumably is an expansive army encampment, although very little can be seen amidst the foliage other than barracks, few soldiers in evidence. Surprisingly, little in the line of police or soldiers are visible in Mandalay to begin with, which I find somewhat strange and unexpected. 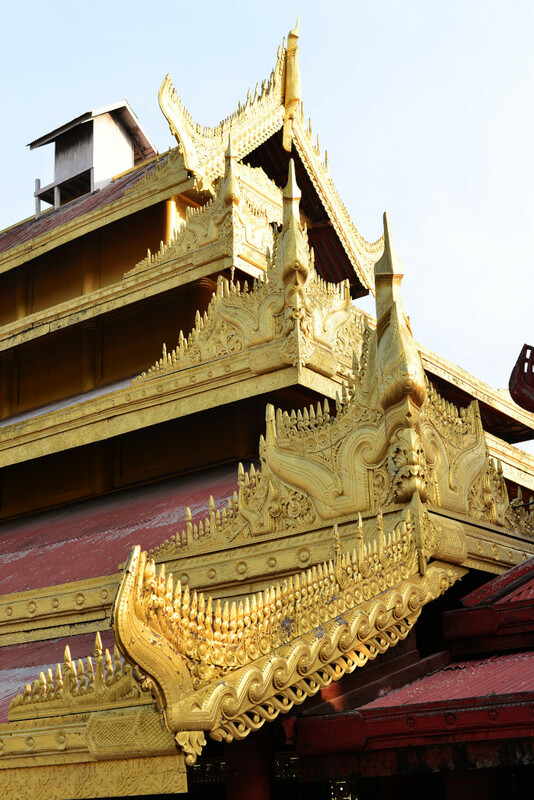 The Golden Palace is a truly spectacular affair, counting many smaller and larger structures in its complex, a towering pagoda, the individual diminishing tiers of which are fronted by elaborately-carved and gilt fascia, a common theme for the central palaces arrayed to the side of the pagoda, each allocated to a particular individual function and activity of the royal family. 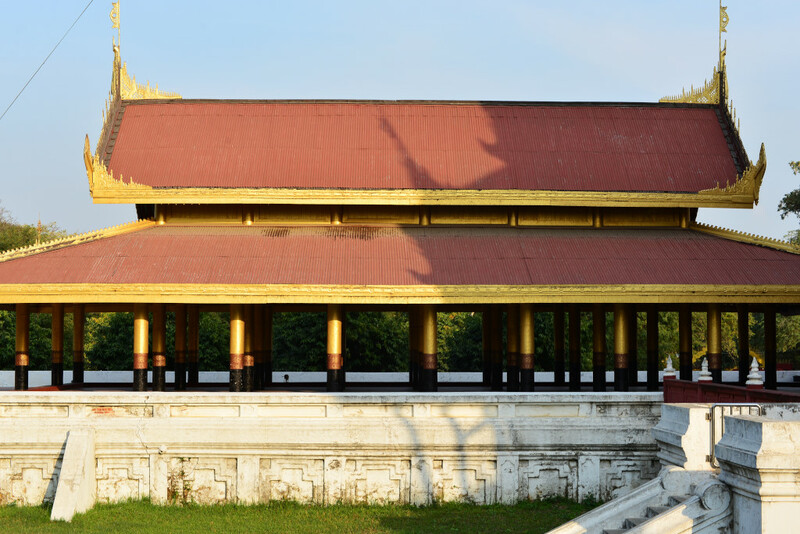 The impressive architecture is largely intact due the fact that the teak and gold palaces were only built one and a half centuries ago. 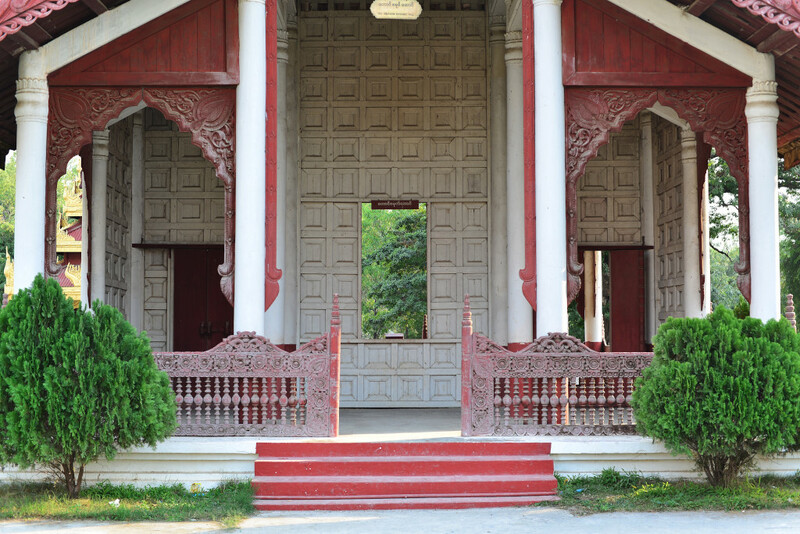 Unfortunately no photos may be taken in the Cultural Museum on the far side of the palace, glass vitrines dedicated to statues of the senior administration officials of the 19th century kings whose reigns represented the apogee of Mandalay’s prestige, ministers, deputy ministers, deputies to the kings, and ambassadors, attired in the exotic dress of the contemporary Burmese nobility. 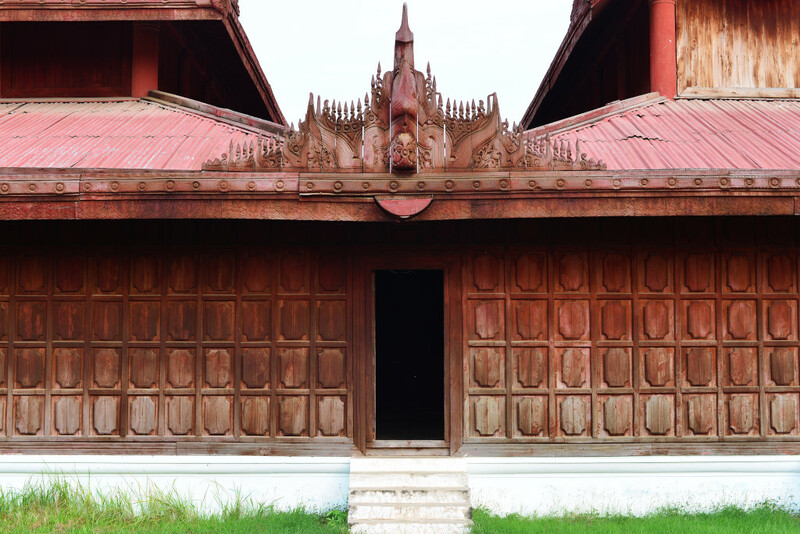 Elaborately-carved wooden statues of Buddha and boddisatvas are featured in the poorly-lit second chamber. 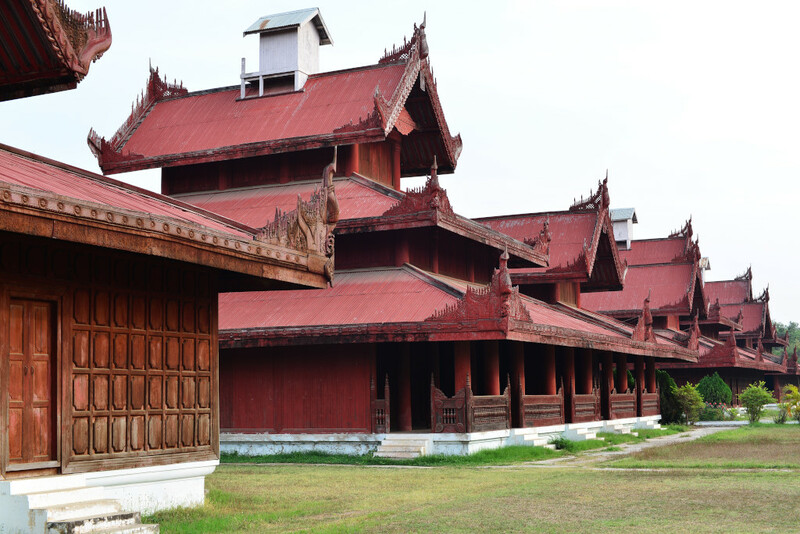 The western confines of the Golden Palace are dedicated to a grid of identical teak structures, coffered panelling of the single-story structures rising up to the characteristic terraced roofing, each layer encased in gilt bargeboards beautifully carved with floral patterns, crowned in bristling sinuous finials. The interiors of the structures are also largely identical, columned antechambers lying next to large interior rooms accessible by means of small doorways, also entirely hidden in darkness. The fort being the lungs of the city is evident from the views offered from the upper terrace of the clock tower, a thick carpet of green extending to all four boundaries of the fort, the city visible on the distant horizon. And unlike the rest of the city, the air here really is quite clean. 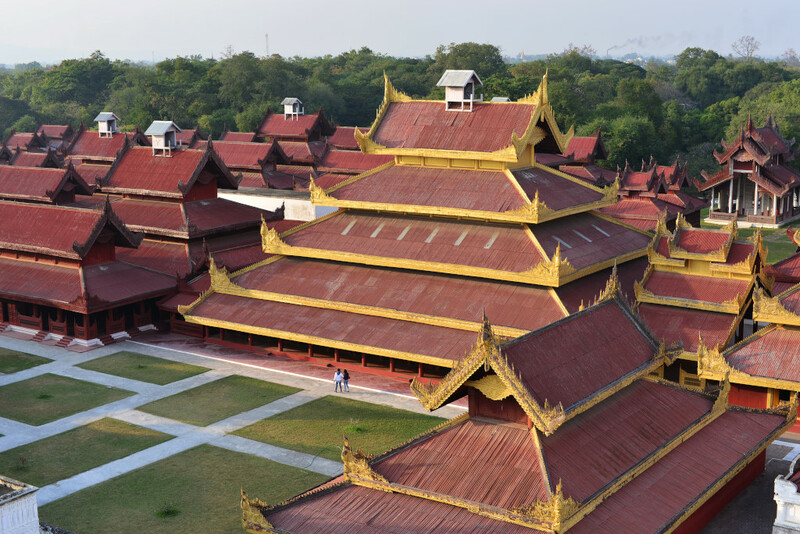 Despite the continual flow of tourists into the palace, there are no tour groups, at least at the moment, which effectively diminishes numbers to a smaller and more manageable amount, especially given the expansive size of the Golden Palace grounds. And even more unusual, most of the tourists seem to be local, groups snapping photos of each other, one group of women erupting with laughter as I play with their attempts to photograph me. There is no gym where the receptionist at the Sedona hotel pointed me to – but a block further, I am directed a few blocks away, and in a small cubbyhole, I can already see the half-naked, beefy locals preening themselves in a post-apocalyptic setting. The equipment I am graciously allowed to use for free is out of some medieval horror movie, making the run-down gyms I saw in Thailand seem state-of-the-art. Everything is ancient, grimy, broken, jury-rigged, and not even marginally safe. 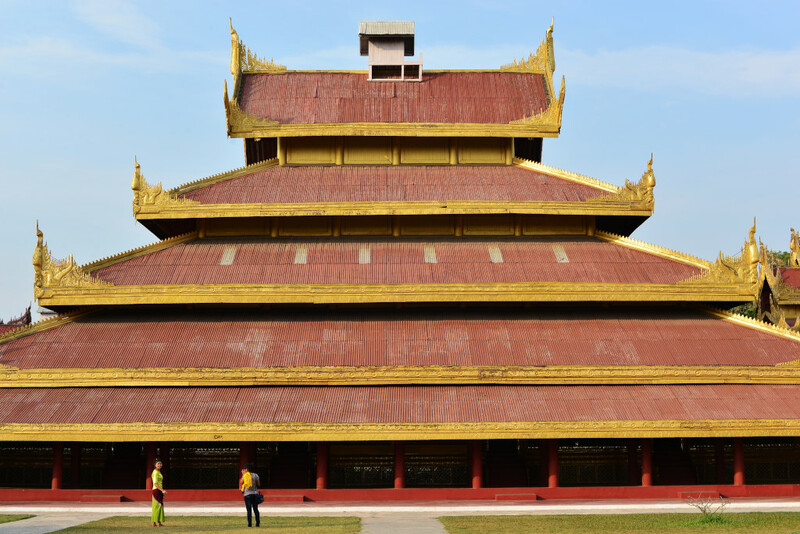 The larger men are of Indian heritage, but no matter how much musculature the Burmese add to their frames, they are condemned to remain smaller. Beyond the basic exercise, attending such a gym also offers an entry into local culture in its own off-beat way. For one, it is unlikely that anywhere remotely the same body image culture would exist here as it does in North America. On the other hand, young men probably spend relatively more on hair styling here than most of other countries in Southeast Asia, judging by the amount of gelled and styled hair, and hair salons in the city catering to men. I am feeling somewhat disconsolate, thinking I should go out and eat, but all the decent eateries are on the east side of the railway tracks. Only a few have truly non-Burmese food, and I simply am not in the mood for making an effort to go out and dig into another round of this truly revolting fare. 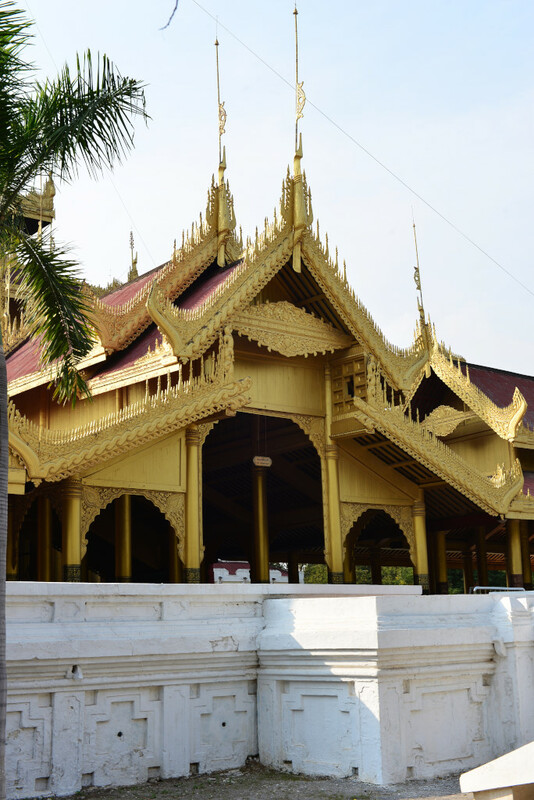 There are options in Mandalay, but the best resource would be Tripadvisor, hideously slow to navigate as are most websites in the evening. As it gets closer to 9 pm, I am thinking of simply aiming for whatever is most convenient, and hoping for the best. Apparently there is a an Australian restaurant with burgers, pizza and beer on 27th Street between 80th and 81st, but riding back and forth in the dark, I see no trace of it. I see nothing but the usual grimy eateries with dilapidated chairs and tables strewn over the pavement, naked bulbs dangling under tattered canvas tarpaulins, clusters of pots containing remnants of the day’s offerings, bland, oily curries of mutton, chicken, duck, organ meat, some vegetables, small dishes with fish sauce, chili, curried potatoes and radishes, and wilted salad strewn on the tables of the locals bent over and unceremoniously stuffing the putrid food into their mouths. I slow down to take in the spectacle of foreigners enjoying the same culinary delights, leaving me somewhat speechless, although around the mosque and Dravidian temple there are a few paratha vendors, the stuffing utterly bland and flavorless, as befits food for the Burmese marketplace, but nonetheless happily utterly bereft of fish paste. I ride aimlessly around the dark streets, then finally decide to land at the same eatery I met the young Spanish couple the other day, in the remains of the 84th Street night market. And the first time I decide to leave my umbrella at the hotel, after five weeks of uninterrupted sunshine, the night breaks out into flashes of lightning, a few drops morphing into a momentary downpour, the young men seated outside at the tables scurrying to their motorcycles or to the cover of the more firmly-anchored tarps. The rain provides a brief distraction from the unfortunate culinary reality before me, and despite the possibility of getting absolutely drenched if the rains pick up seriously, I decide to get back on my bicycle and ride through the almost empty streets, the air now thankfully cooler and fresher than before, the bright neon lights pretty to look at and the rest of the unsavory streetscape swallowed into the darkness. Strains of music and a small night market resound on 84th Street around 34th, a small group of people huddled at a stage where the undulating baritone of a traditional crooner washes over the gathered few. A beaming man stops and informs me that it is a celebration for the 100th birthday of General Aung San, a truly memorable and important occasion – except that there is only a small group of people here, and I have no umbrella. 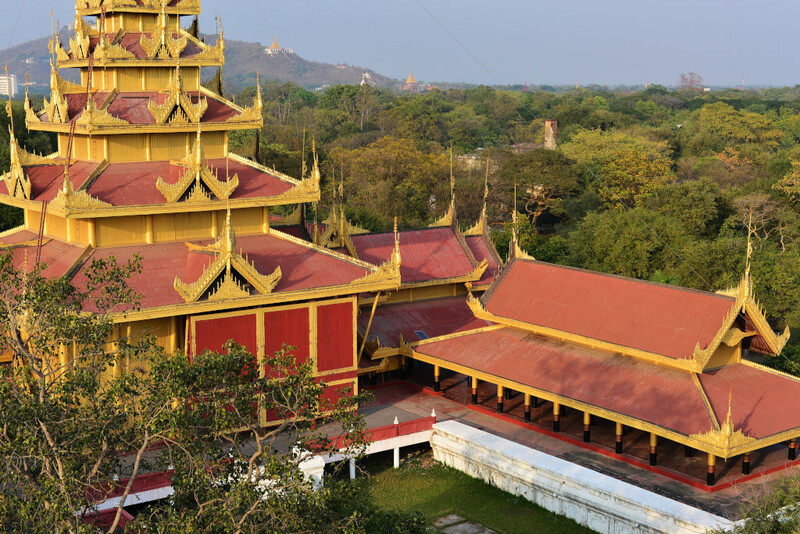 This is definitely a moment of historic importance, and the music wafts evocatively across the refreshed nocturnal streets Mandalay. Perhaps I should come back later, when more people have gathered, although I doubt that will happen. I ride around the neighboring side streets, stopping off at a few hotels that charge upwards of twice as much as the place I am staying in. 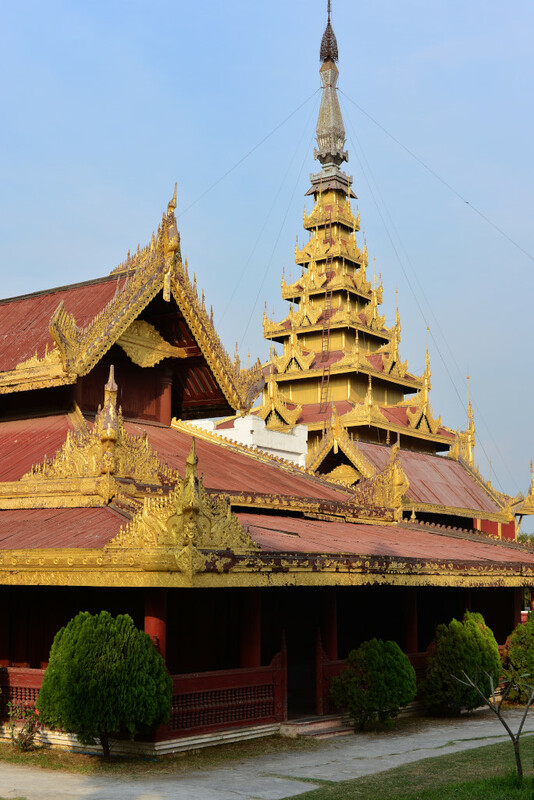 Sure, perhaps the places are much nicer, but the prices are simply high for a country as economically underdeveloped as Myanmar, as definitely dramatically out of synch with the pricing found in neighboring countries. 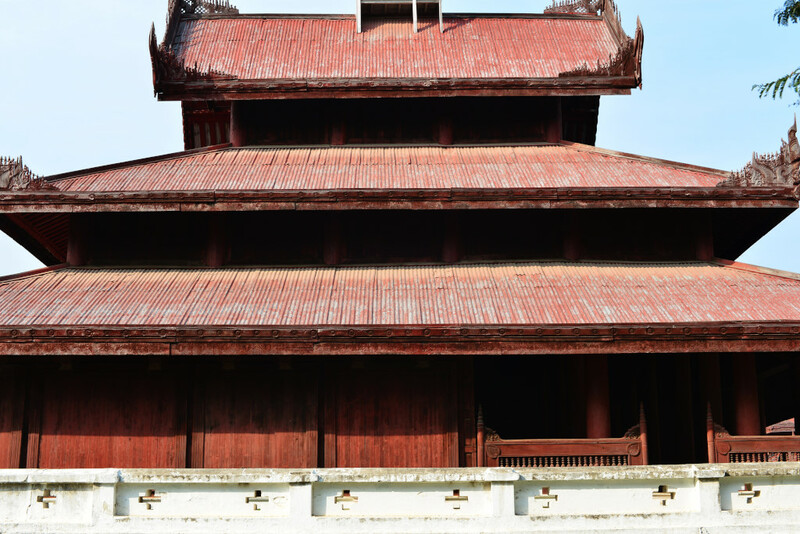 The challenge will arise when the country is no longer a trendy destination, and tourists will begin comparing it to what neighboring countries offer in terms of value. 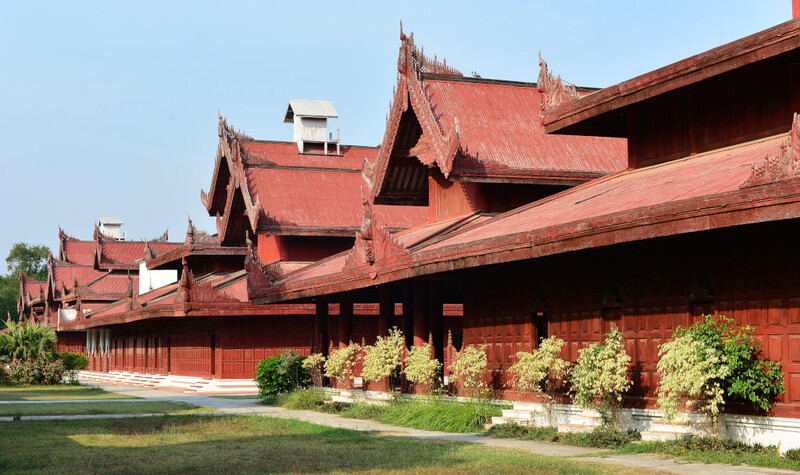 At one hotel, some old American hippies from various parts return to their hotel, Janet, the sister of the brother who has just bought a house in Chiang Mai visiting Burma with him for a week. Over a cigarette and beer she tells me of the challenges her area of northern California is having with the environmental and criminal impact of the large-scale marijuana agriculture. She is shocked to hear that meth is a huge problem in northern Burma, shaking her head at the devastating health effects the drug has. She speaks of the myriad problem the region in California she lives in faces, even though it is located in a beautiful backdrop of redwood trees, and in any case, she is spending a month here to just forget about those things.